12 Then he said, “Don’t be afraid, Daniel. Since the first day you began to pray for understanding and to humble yourself before your God, your request has been heard in heaven. I have come in answer to your prayer. 13 But for twenty-one days the spirit prince of the kingdom of Persia blocked my way. if Jesus thought it was important enough to thank God before the answer came, then we should certainly get in the habit of not only asking, making our requests known, but let’s take it one step further and start thanking God for the answer even when we don’t see any sign of it happening. 11 … and of them that shall bring the sacrifice of praise into the house of the Lord. For I will cause to return the captivity of the land, as at the first, saith the Lord. Judah means praise. the enemy, when you first get up you’ll hear his threats, you’re not gonna make it, you don’t have the $, your health is not good; the last thing you hear before you go to bed, it’s not gonna work out, too much is coming against you. when you’re in a valley, fear will try to occupy that valley, in the morning, anxiety will try to come into that valley, at night before you go to bed, stress, doubt, intimidation, will try to keep you up at night; know this, that valley doesn’t belong to the enemy, it belongs to praise, now you gotta take your valley back. all through the day when the thoughts come saying it’s not gonna work out, the problem’s never going to turn around, don’t dwell on that, don’t let that occupy that valley, turn up your praise, “Father, thank You that You’re still on the throne, bigger than this obstacle, fighting my battles, the answer is already on the way.” when you learn to give God praise in the valley, you will defeat every giant. doesn’t matter how big that obstacle is, you and God are a majority, He will always cause you to triumph. Now, granted, begging and asking are different things, and not begging is a valid instruction… but asking once and believing that God heard you and thus not asking again is simply not compatible with “give Him no rest ’til it comes to pass.” And, if you’re thinking about something constantly but deliberately holding back when you want to ask, what have you gained when God can read your mind? 22 Then one of the leaders of the synagogue named Jairus came and, when he saw him, fell at his feet 23 and begged him repeatedly, “My little daughter is at the point of death. Come and lay your hands on her, so that she may be made well, and live.” 24 So he went with him. And a large crowd followed him and pressed in on him. There may be more than one story of Jesus first refusing to help a woman and then eventually helping her, but I could only find one. I’ve chosen to post a link to a discussion of the incident rather than the quote because Jesus speaks to the woman in a way that needs explaining for modern ears. The point for the purposes of this post is that Jesus at first held back from helping the woman, NOT because she was begging, but because he and the disciples were supposed to be on a break, and because she was not a Jew (remember that he and all those with him were Jews, and he was a messiah specifically for the Jews). Again, JO’s point about trusting God and not being a beggar is still a valid one, but clearly begging at least once when you’re in great distress is fine, and asking repeatedly when God already knows you’re thinking about it repeatedly is likely fine too… AS LONG AS your attitude is that He WILL provide, not that you have to badger Him into providing by asking many times. 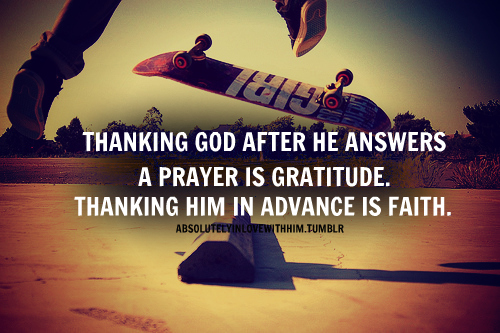 And DO offer thanks and praise every day, for no matter what else is going on He clearly deserves that from each of us.